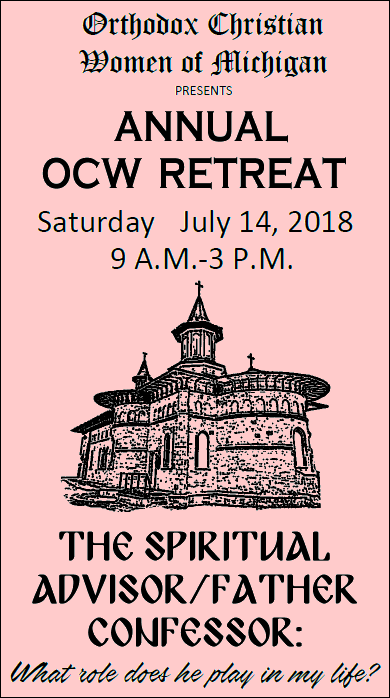 DETROIT, MI [COCC] -- Orthodox Christian Women of Michigan (OCW) will hold its annual retreat on Saturday, July 14 from 9 a.m. to 3 p.m. at Holy Dormition Orthodox Monastery, 3389 Rives Eaton Road, Rives Junction MI 49277. "The Spiritual Advisor/Father Confessor: What Role Does He Play in My Life?" will be the theme of the retreat. Archpriest Father Dusan Koprivica of St. Demetrius Orthodox Church, Jackson, will be the guest speaker. The retreat will include a Divine Liturgy and a luncheon. OCW was founded in 1993 to provide spiritually enriching and educational presentations and activities, to promote Orthodox unity, to provide opportunities for Inter-Orthodox fellowship, and to perform charitable works. All women who are members of Orthodox Christian parishes in metropolitan Detroit are invited to become supporting members and participate in the organization's activities. The cost of the retreat is $20 for OCW members, $25 for non-members. Registration by July 7 is required. Checks should be made payable to Orthodox Christian Women of Michigan and sent to Loretta Gates, 37 Scottsdale Drive, Troy MI 48084. For further information, call her at (248) 689-9721. CLICK HERE to download the flyer with registration information.